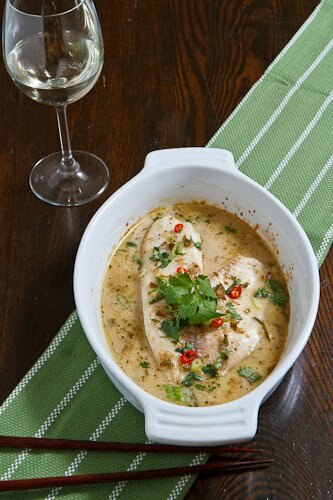 Tilapia baked in tasty Thai green curried coconut milk. Now that I had my Thai green curry paste it was time to get down to business and make some curry! I wanted something on the lighter side and I immediately thought about fish which I have been enjoying a lot of lately. 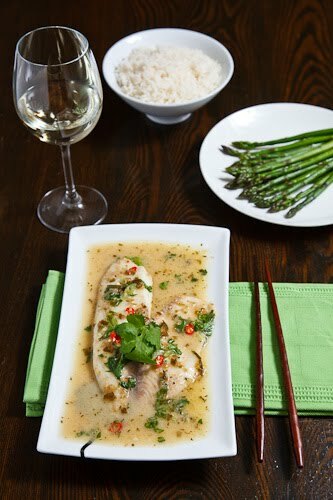 The basic idea was to simply bake some fish in Thai green curried coconut milk and to serve it over jasmine rice. Since asparagus is in season it seemed only natural to add some to the dish as well! The curried coconut milk starts out like a lot of Thai curry dishes with the coconut milk and curry paste along with some fish sauce for something salty, some lime juice for something tart and a bit of sugar for something sweet. After quickly making the curried coconut milk I poured it over the fish in a baking dish and thew it into the oven to cook. Baking the fish in the coconut milk helps ensure that the fish stays nice and moist in addition to imparting the all of the tasty flavours to the fish. I served the tilapia baked in curried coconut milk on a bed or rice topped with asparagus and I poured the remaining curried coconut milk over everything. All of the extra coconut milk was quickly absorbed by the rice helping to ensure that every bite was packed full of flavour! I finished the dish off by garnishing it with lots of fresh herbs and sliced birds eye chilies. Overall this was one really amazing light dish that is just brimming with flavour and perfect for spring! Heat the oil in the a pan. Add the coconut milk, fish sauce, sugar, lime juice and zest and lime leaves and bring to a boil. Pour the curried coconut milk over the tilapia fillets in a baking dish. Bake in a preheated 350F/180C oven until cooked, about 15-20 minutes. The fish will be cooked when it flakes easily and it is no longer translucent. Serve garnished with cilantro and red chillies. I adore green curries, they are my favorites. I can't believe I never tried baking the fish, I always simmer on the stove. Whoa, Kevin! My favorite flavors melded all in tilapia! This looks wonderful! One of my favorite curries! And with fish, too! This looks terrific! I love Thai curries too. In fact, I just made one with chicken and eggplant for dinner tonight. What a beautiful dish- and an inspiration to make my own curries at home! OH MY GOODNESS this looks amazing! I love anything with curry in or on it! Thanks for sharing!! Mmmm yum! This does look GOOD! Coconut milk/cream does keep everything really tender and moist, especially fish. Great choice. This looks so delicate and fragrant. what a lovely idea with the asparagus! What a refined looking curry! Fabulous. Tilapia is a fish I really enjoy. There is little I love more than a Thai curry and I especially love how light and healthy this is! What a gorgeous meal! Follow "next blog" to get here. Love it!! Your pictures are great! I can't wait to try out some of your ideas! This looks delicious. I'm wondering if it would work well with other kinds of mild white fish. I live in Seattle, and there are so many great seafood choices here. I have some true cod filets I'd like to try with it. Think the baking time would be about the same? Mel: A lot of different kinds white fish including cod would work well in this dish. The baking time should be similar assuming that the cod pieces are not a lot thicker that the tilapia. Two things to look for to know when the fish is done is that it is no longer translucent and that it flakes easily. That dish looks perfect Kevin! I really need to seek out some kefir lime leaves. I make curries, but usually skip that part. Inspiring! I love Thai curry and I love fish, but I had never thought to make them together – I usually do a chicken of green vegetable curry. Definintely putting this on my to do list. Love, love, love this recipe. I've been trying to add more fish to the diet. This recipe also fits in perfectly with South Beach. I added green and red pepper strips, fresh mushrooms, and green onion to the mix. Next time around, I'm going to add basil too. I'm a huge Thai curry fan, and am thinking of trying this with chicken sometime. Thanks for the recipe!!! 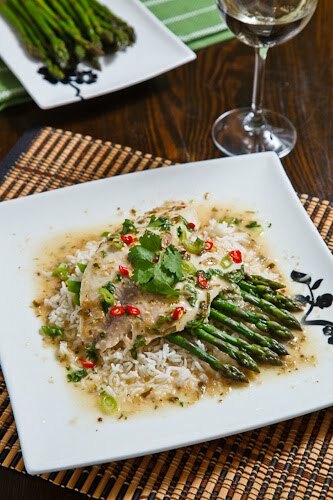 Looks fantastic, I've made similar with Halibut, it's sooo good! Beautiful food and gorgeous styling. You are the king of different cuisines! I cheated and used a prepared green curry, but followed the rest of the recipe and it was amazing. My friend said it was some of the best curry he had ever had! Very nuanced flavors and a flaky, moist fish. Thanks for this. Your blog keeps getting better and better! Just got done eating this for dinner and it was delicious! I didn't have kaffir lime so I skipped that and the pepper for garnish. It wasn't missed. I served it with basmati rice and it was really amazing. I was so proud of myself!!! Thanks for sharing!!! !